Kaspersky now offers a free antivirus for PC, but do you need it? 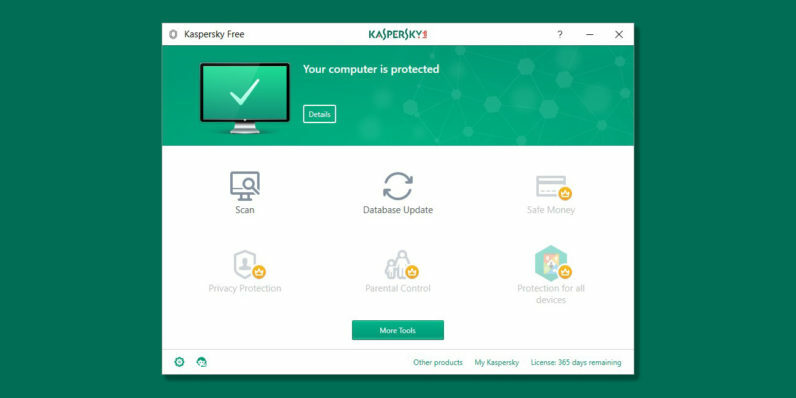 Security software firm Kaspersky has just launched a free antivirus for PC users, promising total protection for your files and oversight of your web traffic for malicious activity. The company says it’s happy to offer its service at no charge for those who can’t afford the $50 fee for its paid product – but do you really need a third-party antivirus tool? If, like 500 million others, you’re on Windows 10, you already have Windows Defender built in. Microsoft’s own tool does a pretty good job of keeping computers free of nasty viruses and doesn’t hog system resources. The folks at AV-Test.org gave it a 5.5 / 6.0 protection score, which isn’t half bad for an app that you don’t even need to download. Meanwhile, Kaspersky’s full package, which is called Internet Security and was at v17.0 as of June when it was tested, got perfect scores of 6.0/6.0 for protection, performance and usability. So, in theory, Kaspersky’s offering should be able to cover you a bit better than Windows Defender does. However, I can’t say I’ve felt the need for a third-party antivirus app in the past few years. Since Windows Defender came along, I haven’t faced any virus-related issues, even after mucking about with USB drives from sketchy sources (read: local cyber cafes I visited to print travel documents) and streaming shows that aren’t available to me in India. Heck, I haven’t even had to fix my parents’ computers in a long time, and that’s saying something. If you’re truly concerned about keeping your PC squeaky clean, Kaspersky Free might be worth a look. Presently available in Russia, China, and a few European nations, it’s rolling out elsewhere over the next four months. You won’t get features like a firewall, VPN or private browsing, and the folks at HowToGeek recommend adding on an anti-malware app for increased protection. What’s your antivirus setup like? Let us know in the comments.